Since it's Valentine's Day today, I thought it'd be appropriate to share some images related to love and romance from my Dynamic Duos & Romantic Pairs board on Pinterest. For the record, I'm not big on how commercialized Valentine's Day has become but I do believe that love in all it's forms should be celebrated. Doing things for the ones you love and appreciating them every day is just more meaningful than buying them a present on a day when you're "supposed to" in my book. What do you all think? 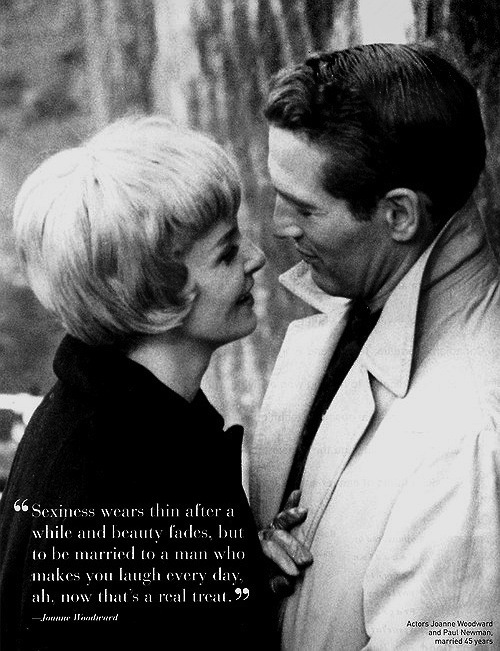 Paul Newman and Joanne Woodward were married for 50 years until his passing in 2008.
are one of Hollywood's greatest love stories and there is so much truth in her quote! 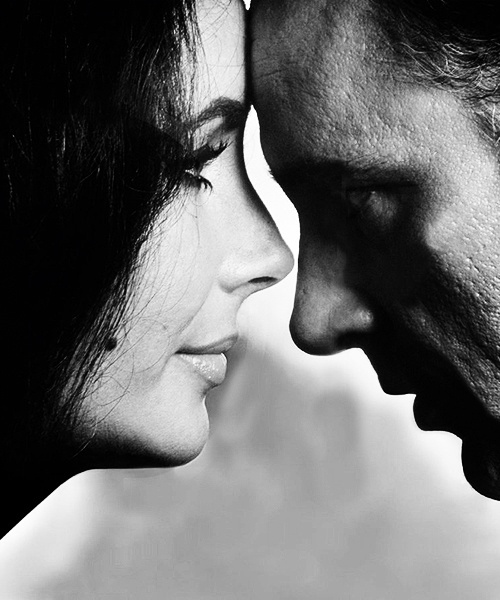 Another great Hollywood love story would have to be Elizabeth Taylor and Richard Burton. This is such an amazing photo of them. Emma Stone and Andrew Garfield are a modern Hollywood love story. They both seem so down to earth and are very cute together. Being able to laugh with someone you love is one of the great pleasures in life. Love can be conveyed through a touch. 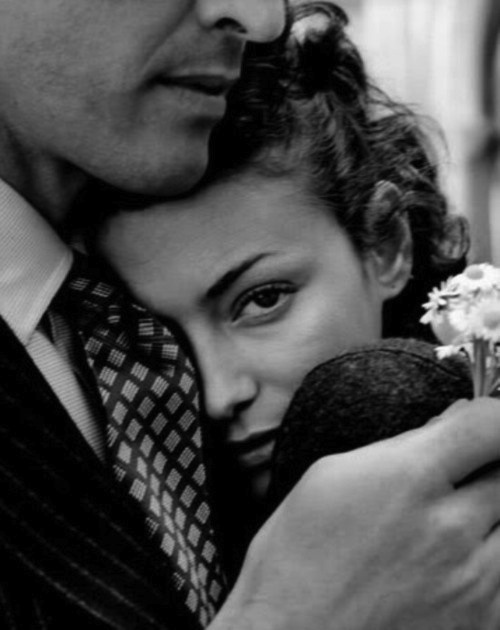 Lovely image by Robert Doisneau. 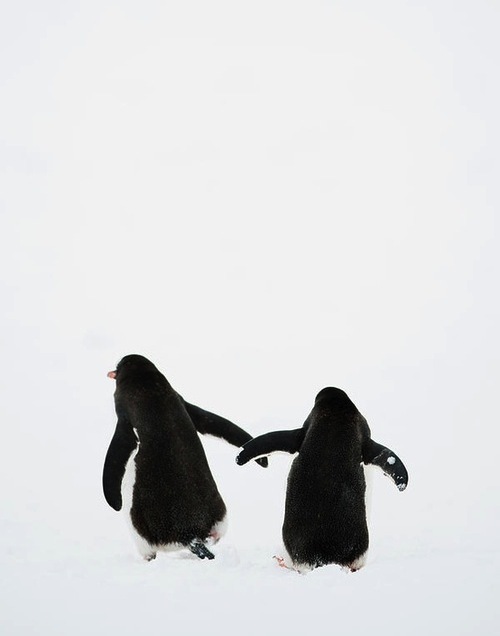 Penguins mate for life. This is too sweet! love all the pictures you posted! Love is amazing. the last pictures of the penguins are the cutest. The penguin picture just melted my heart! How beautiful!! completely agree with your sentiments on Valentine's Day. I do adore how much love I see today but dislike the commercialization of the holiday. BUT...I guess that's true of most of the holidays nowadays. I think that's why I love Thanksgiving. haha...just pure family/food (though even that holiday has given way to people ditching their family/food for waiting in lines for sales). hah. Anyway...HAPPY VALENTINE'S DAY! Love all of these images. So sweet! Thank you so much for your sweet words to Mendi. It's so appreciated!! Beautiful photographs. As for the celebration - I don't celebrate the day either. Just like you I believe that love doesn't need to be celebrated like Christmas and then be forgotten about for the other 364 days... It's an everyday thing, it's either there or not and no amount of cards, gifts or chocolate will fix the void. I think Valentine's day is perfect for people who want to confess their love to somebody special. It's a great day for teens because it's just so exciting to receive a card from a secret admirer (and the more the better ;) ) But when you are married and happy, you have Valentine's day every day. Anyway... I did make brownies tonight. And this is as far as I went, celebration-wise. :D Then I went and watched Calvin Klein live stream while Mr played on his iPad. And it was perfect. Hi Rowena, thanks for sharing these sweet romantic images and lovely thoughts, I agree on your stance on the non-commercialisation of love. Happy Friday! Happy valentines day Rowena! I bet Ian and rena are off to dinner ;). The very last penguin photo is just too cute! I completely agree that love should be celebrated every day! Happy Valentine's Day Rowena! Those pics are so cute doll! LOVE should be celebrated EVERYDAY! EVERYDAY is a gift! Thanks for entering my MAC Archie's Girls contest! Good Luck Doll! Happy Valentine's Day Rowena! These photos are beautiful. The last one is perfect. Love your choices. i totally agree with you sweetie! i now view valentine's day more than just the "romantic love" but the love that we give and receive as human beings. although, i still do enjoy these sweet pics - especially the one of paul and joanne. they are definitely to be admired for their great love. Great collection! Love the penguins! So adorable! This is such a sweet post! I hope you had a LOVEly day and you will have a wonderful weekend! These are such beautiful pictures! I love V-day even though I am single! great photos! hope you had a nice valentines day! Love the romantic photos! I hope you had a wonderful Valentine'!! Oh Rowena, this post made me a tiny bit teary: there's so much love and truth in these pictures! I completely agree with you on the importance to celebrate those we love every single day! Thank you so much for bringing these beautiful pictures to me! I agree that something done when it's not expected is so much nicer than something done when you are "supposed to". The penguins are so sweet! I will give the show a second shot, probably the same episode. I haven't really found any other good comedies lately and I would love to. I hope you are having a great weekend! I truly love these romantic photos! The loving penguin pic is just the best! Yes, love should be celebrated every single day. Beautiful photos!